Can be bolted to supporting structure or free standing on 6mm thick ribbed rubber pad. This unique range of open spring mounting uses an integral rubber end fixing of the spring which sets them apart from all other designs. 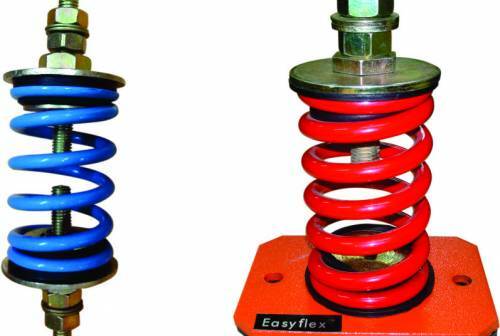 Loose springs and plates are now history and high frequency and noise attenuation is provided regardless of whether rubber seating pad is used or not. Originally designed for use with type IPF Inertia Pouring Frames, the EFOS Mountings are now widely used to isolate vibration from every conceivable type of rotating and reciprocating machine. Some examples being air handing units, axial and centrifugal fans, low level pipe work, ductwork, condensing units, pumps, generating sets, chillers, etc. 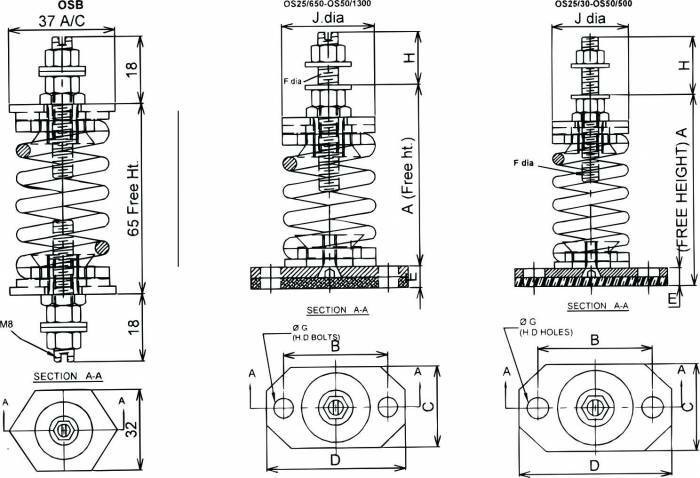 Where control of transient motion is required open spring mountings can be used in conjunction with our Viscous Dampers Type EFVD.